My husband, AKA The Grill Meister, made dinner last night. As I said before I don’t even fire up the grill when he’s not at home. I think he was born with a “grilling” gene in his DNA! He said this recipe was too easy to put on my blog, but I said easy is where it’s at. 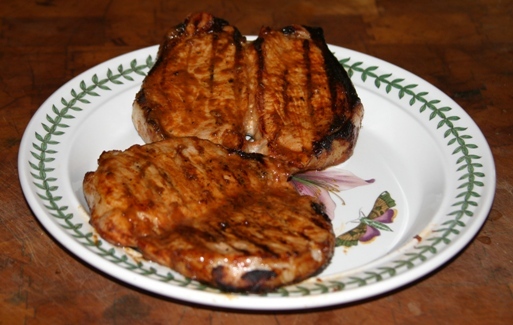 Coat all sides of the chops with Woody’s and let marinade for at least 2 hours in the fridge. Take the chops out of the fridge and allow the chops to come to room temperature. Fire up your grill. We use a hot charcoal grill that will seer surface and hold in the juices. Depending on how thick the chops are, we grill them 4 to 5 minutes on each side. Now that’s some good eatin’. This entry was posted in grill, main dish and tagged pork. Bookmark the permalink.